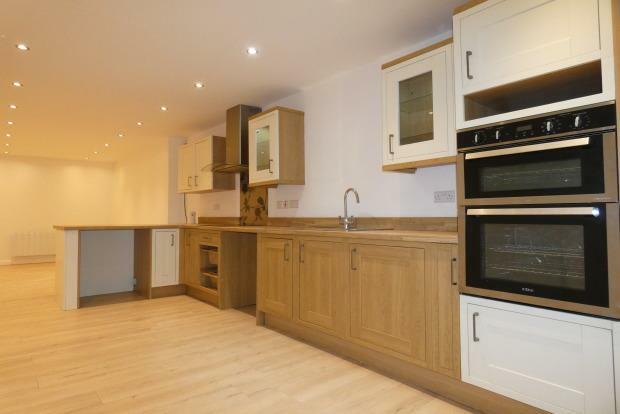 2 Bedroom Apartment To Rent in Belper for £595 per Calendar Month. On the edge of the historic, mill town of Belper is this beautifully presented and spacious, unique, cottage style apartment! On entering the property is your large, open plan kitchen/dining and living area laid with wood effect laminate flooring. Having a side elevation door leading into the kitchen/living area as well as a side elevation double glazed window, the bright and spacious room offers an abundance of living space. The kitchen is fitted with a range of wood and cream effect wall and base units and wood effect preparation work surfaces. The kitchen comprises of a one and a half bowl sink/drainer with mixer tap, integrated electric oven, integrated electric induction hob with extractor over, space and plumbing for a washing machine or further domestic appliances. The living area/lounge has a TV and telephone point, electric heater, laminate flooring and recess spotlighting. This room leads off to the inner hall. The high specification shower room comprises of a wash hand basin built into vanity unit, W.C, shower cubicle with electric shower, panelled wall tiles, tiled floor and a chrome effect heated towel rail. The large master bedroom found at the end of the hallway is a great size, having a side elevation double glazed window, laminate flooring and electric heater with TV point. Adjacent to the master is the second bedroom, a smaller ample size double, having a side elevation double glazed window, laminate flooring and electric heater. Externally there is a â€˜drop offâ€™ only point with on street parking found at the end of the cottages. We are led to believe included within your council tax is a free car park voucher for the near by car park. The property has been finished to an excellent standard throughout. Available straight away with the Zero deposit option available. Kitchen/living Area -Open Plan 31' max x 9' 9"